Your Initial Visit will begin with filling out a confidential health history. 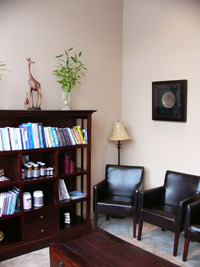 You will be given a tour of the office and then consult with one of the doctors. Your doctor will review your health history and discuss your current health status and goals. The initial consultation is complimentary. If the doctor feels you are a candidate for chiropractic care and you choose to continue with a comprehensive exam, you will move to the examination room. Here the doctor will perform a complete, comprehensive physical exam including postural, neurological, orthopedic, and chiropractic assessments and two computerized scans of your spine. If necessary, spinal images will be taken and are available on site. You can expect your initial visit to last approximately one hour. The total for this visit is $185 and includes a report of your findings and first chiropractic adjustment, which will take place on your next visit. After we have reviewed all of the findings from the consultation & exam, we will give you a full Report of our Findings. This will happen on your Second Visit.